Marine dealers say government inaction was the single biggest factor in demand for new boats as the industry awaits tax reform — however, dealers didn’t rank it as impactful as they did last year or in 2015. “Favorable tax legislation, if passed, should improve consumer confidence. If not, it could produce a negative impact,” said one dealer in the monthly Pulse Report conducted by the Robert W. Baird firm, the Marine Retailers Association of the Americas, and Soundings Trade Only. “If Washington does their job, maybe we’ll see another boost this spring,” said another dealer that participated in the survey. 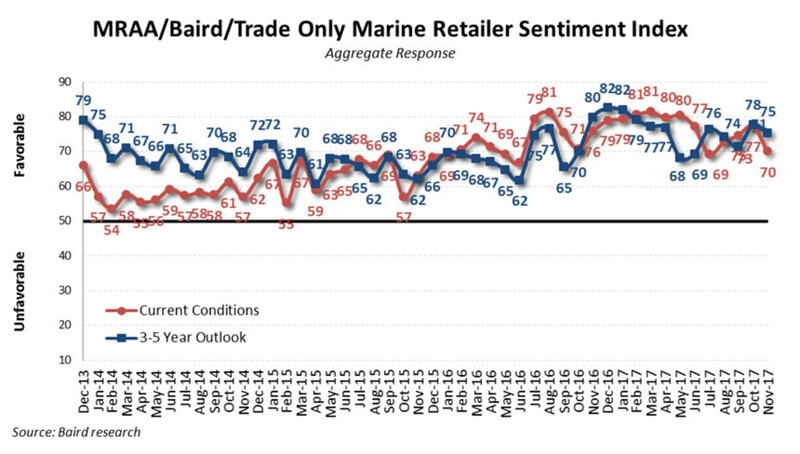 Marine retailer sentiment based on conditions decreased sequentially, from 77 to 70, and dropped from 76 last year. The 3- to 5-year outlook also dropped, from 78 to 75, and relative to last year, when the longer-term outlook was 80. Seventy-three dealers participated in the survey. New-boat retail growth moderated in November, but remained positive as 35 percent of retailers reported growth and 26 percent reported a decline. Used-boat retail trends in November were consistent with the prior month, as 31 percent of retailers reported growth, compared with 35 percent in October and 29 percent in November last year. November represents just about 3 percent of annual retail sales, so the trends are not particularly relevant, Baird analysts said in the report. In November, more dealers considered new-boat inventory “too high” compared with “too low,” with 38 percent saying they believed they had too much product versus 8 percent who said they didn’t have enough. “We believe inventory levels are appropriate, but marine retailers prefer less inventory during winter months,” Baird analysts said in the report. 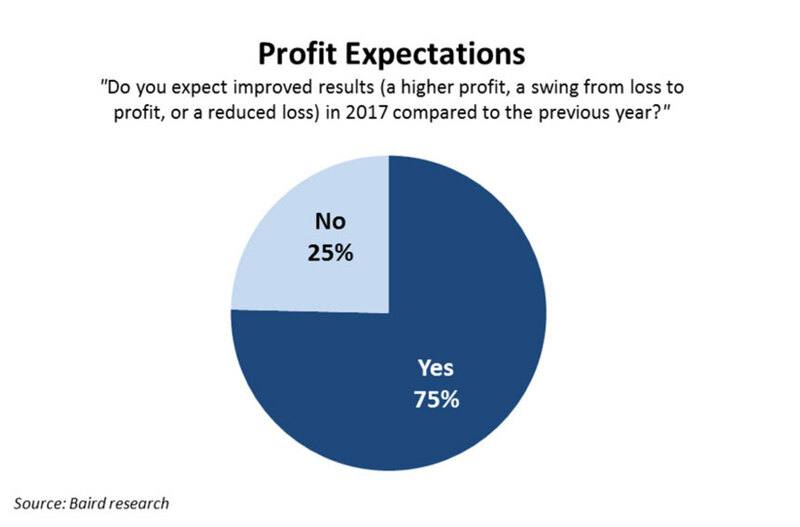 Profit expectations for 2017 were high, with 75 percent of marine dealers surveyed expecting better profitability in 2017, compared with 2016. Although most dealers reported volume growth, some commented on margin pressure, leading to lower profits. Dealer comments around profitability varied greatly, with some saying they expected large increases and others saying they expected to be flat or down from last year. Margins were a large topic, with several dealers saying they continued to tighten. “Margins are getting squeezed, due to customer shopping nationwide to find the best deal,” one dealer wrote in the comment section. Others said hurricanes damaged their profits. Some dealers worried that manufacturers had an overly optimistic outlook that would lead them to push more inventory on dealers than they could handle. The Pulse Report is designed to provide industry professionals with a regular, timely look into retail trends at the dealership level. The Marine Retailers Association of the Americas and Baird Research launched the report in December 2013 as a first-of-its-kind tool compiled specifically for marine retailers. Soundings Trade Only joined the partnership with Baird and the MRAA in February and will continue to participate in the survey’s distribution and results reporting. Retailers who would like to participate in the survey can email Baird senior analyst Craig Kennison at ckennison@rwbaird.com.